Weekly Indicators for January 15 - 19 at XE.com. The new 40 year low in jobless claims was overshadowed by the jump in interest rates. Between 1931 and the mid-1950s, the yield curve never inverted, and yet there were 5 recessions (1938, 1945, 1948, 1950, and 1954). In particular, the 1938 "recession within the depression" was one of the worst of the 20th century. So in a low inflation and low interest rate environment, where the yield curve may not invert, are there other signals from the bond market that are reasonably reliable? A month ago I noted that spreads between corporate bonds and government securities have a very spotting record during more deflationary eras. Twelve to eighteen months prior to 8 of the last 9 recessions, the Fed increased rates YoY by 1.5% or more.There were 4 false positives, two of which involved hikes of 1.5% or 1.75% (1962 and 1966), and one potentially false negative (a 1.5% increase in the Fed funds rate preceded the 1957 recession by 21 months). In the case of the false positives, there were slowdowns in GDP growth even though there was no outright recession. So, in the most generous interpretation, a YoY Fed rate hike of 1.5% or more is almost certain to be followed by a slowdown, and more often than not by a recession. That's pretty decent even if not perfect. Indeed, with a few exceptions, sharp 1.5%+ increases in the Fed funds rate YoY tend to occur along with equally sharp increases in inflation. 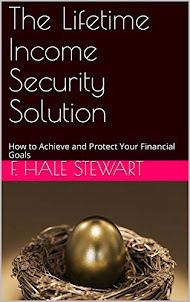 But there are several exceptions, all having to do with the low interest rate environment. In the first place, as recently as 2011, inflation rose from 1% to 3.8%. The Fed stood pat. No recession occurred. Here we have two completely different examples. In the period of 1954-57, the Fed hiked rates by a total of 2.25% while inflation went from negative to just under 4%. In contrast, during the inflationary 1960s-1980s period, the Fed raised rates by 2% or more multiple times without a recession ensuing. In contrast, in the 1958-60 period, inflation remained under 2%, but the Fed aggressively raised rates from under 1% to 4%, and a recession ensured. What we are left with is, even without looking at the yield curve, we can say that *either* a sharp rise in interest rates, *or* a sharp rise in inflation, almost always precedes to a slowdown, and more often than not precedes a recession. Right now, we have neither. the three month moving average of the more volatile housing starts made a new high save for the three month average from 10 months ago. YoY interest rates are no longer a drag on the market, and I am impressed with the strength of the demographic tailwind. While not perfect, this was a very positive report. Whether due to a bounce from hurricane interruptions, or some other reasons, both real retail sales and industrial production have now completed very strong 4th Quarters. Together they point to a good GDP print next week. On this Martin Luther King Day, let's take a look at minority unemployment. This got a little attention earlier this month when the December jobs report showed the smallest gap ever between the unemployment rates of blacks and whites. The secular trend over the last 40 years has been very slow progress, as the relative low in unemployment from the early 1970s was superseded in the 1990s, which in turn was superseded by that of the 2000s, and now that too has been eclipsed. But of course, the black unemployment rate has for that entire time been higher than that for whites. Similarly, for the entire forty year period, the rate of African American unemployment has been higher than that of Latino unemployment. What is most telling is that this metric hit a low point over 20 years ago. Since 1995 the proportion of Latino unemployment has decreased compared with black unemployment. On the one hand, while we don't have any historical statistics that I am aware of with earlier immigrant groups, I suspect that Latinos hare having a typical immigrant experience: the first generation establishes the beachhead, and the second and thir d generations approach the employment norms of the majority natives. Considering that employment in smaller metro areas and rural ares has not grown so strongly during this expansion, and especially bearing in mind that roughly 1/4 of the Latino population (about 12 million of 48 million) are undocumented workers or illegal aliens, depending on your preference, I suspect that the ethnic backlash by Trump voters and the relatively good performance of Latino vs. white unemployment is not a coincidence. 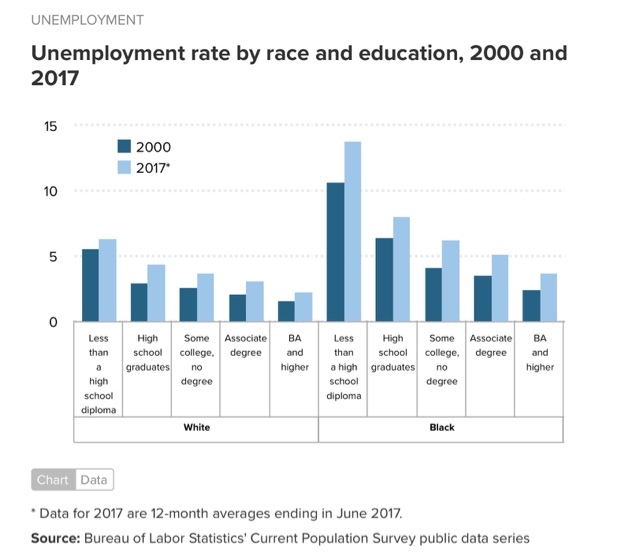 Finally, in view of the continued difference between black and white unemployment rates, I wanted to take a look at how that breaks down by education, since the disparity in college educations may be one reason for the difference in in the rates. 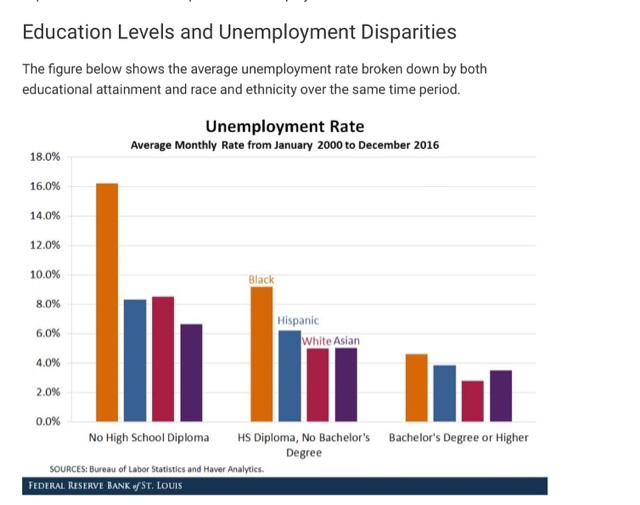 When we consider that even with a conquerable education, the rate of black unemployment is still above that of Latino unemployment, and that black college graduates have an unemployment rate equivalent to that of whites who don't even have an associates degree, I am afraid that racial prejudice still plays a role in the jobs market.